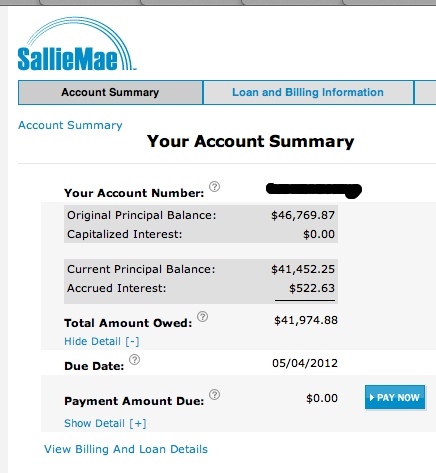 Paid down only about 4800 of this loan over a 4 year period. Percentage-wise that’s a mere 10%. This is a reminder for me that things need to change. Paying the minimum isn’t working anymore. At 300/month, the interest alone would take 6 months to pay off. Then the remaining 1800 would go towards the principal. I plugged the numbers into a loan payoff calculator. The result is that at 300/mo it would take 193 months or 16 years to pay this off. The loan payment after this year is supposed to shift to 121 payments at 453.51 starting 12/4/2012 and 9 at 296.23 starting 1/4/2023. I will still qualify for income-based repayment based on my income for 2011 so it’s highly likely I won’t have to make any more payments for another year. This is a unique opportunity to get my financial house in order and pay down as much of the principal as possible. I don’t want to still be paying this off 5 years from now, much less 10, or pay $9000 in interest over that time. Using The Inflation Calculator, What cost $9000 in 2000 would cost 11279.73 in 2010. That’s approximately 25% more. The math isn’t nearly as cut and dry with inflation, compounding, change in gas prices and all that jazz…but I honestly believe it makes more sense to make compromises now instead of down the road. Especially when tax rates may change and the cost of living will inevitably be higher.